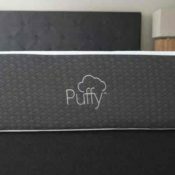 Puffy Mattress Review - Memory Foam Bliss? Home » Puffy Mattress Review – Memory Foam Bliss? Puffy Mattress Review – Memory Foam Bliss? The online mattress world is filled with memory foam competitors. Many of them promise their mattress is the most soothing and comfortable option available. When a new memory foam mattress is unveiled, I am interested to see how it will compete in a market already flooded with quality mattresses. So when the Puffy mattress was recently released, I was excited to see how it would compare to the many bed-in-a-box mattresses I have reviewed. The company has two models: the original Puffy mattress and the Puffy Lux. I reviewed the original Puffy mattress. Is it the next big thing in memory foam? Read on for my full review. Puffy is a comfortable memory foam mattress that is especially great for side sleepers. You can get $250 off the Puffy by clicking the link below and using code BESTPUFFY at checkout. You are an average-weight or lightweight side sleeper. The soft memory foam relieves pressure quite well on shoulders and hips. If you sleep on your side, you should sink in slowly and feel that pressure melt away. You like sleeping “in” your mattress (instead of “on” it). If you like the traditional memory foam feel, this could be a great choice. You really sink in and start to feel enveloped by the Puffy. If this is the feeling you are looking for, the Puffy could be a great choice. You sleep with a partner. Memory foam is usually very good at cutting down on motion transfer. With its thick layer of memory foam on top, the Puffy should keep you from feeling your partner’s movements on the other side of the bed. You are a heavier person. If you are larger, you may think this mattress is firmer. Your weight may cause you to press through the very soft memory foam layer and engage the firm support layers. You are a stomach sleeper or back sleeper who needs more support. Again, the top layer is very soft and it may not offer the support you need if you sleep on your stomach. You may feel yourself bowing in at the hips. Stomach sleepers and some back sleepers will most likely want to find a firmer, more supportive mattress. The mattress is 10″ tall. The first layer is 4” of memory foam. Then there is a 6” base polyfoam layer. The foams are CertiPUR-US certified, meaning they are made from materials that are more eco-friendly than conventional mattress materials. The Puffy is made in the USA. The Puffy is available in Twin, Twin XL, Full, Queen, King, and California King. The memory foam layer is very soft and should do a good job of conforming to the shape of your body. While the memory foam is 4” thick, heavy sleepers may press right through it and engage the support layers beneath. Because of this, they may find the mattress to be firmer. The comfort layer should offer good pressure relief. Side sleepers of average weight should feel comfortable, but the mattress may be too soft to support most stomach sleepers. 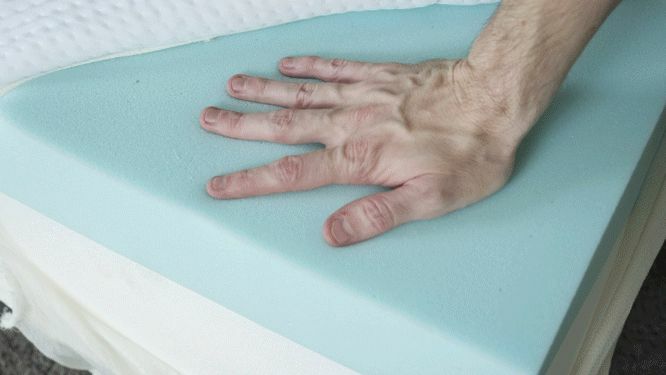 This foam is also designed to be breathable and to dissipate heat. It should keep you cool while you sleep, which isn’t always the case with memory foam mattresses. How does this mattress stack up to one of the most popular mattresses on the market, the Casper? While they do both incorporate memory foam in their construction, they are really quite different mattresses. 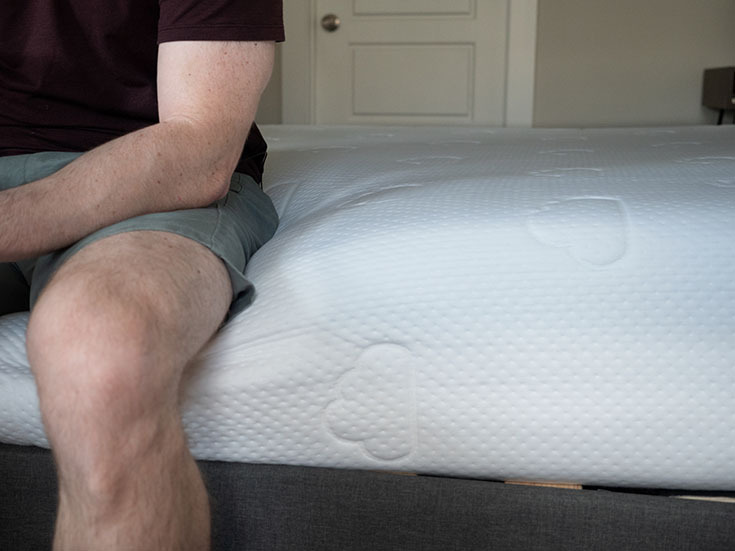 The Puffy has a 4″ layer of memory foam on top, while the Casper has foam in its second layer. Because of this, the mattresses have a different feel. The Puffy has that classic memory foam feel where you slowly sink into the mattress. The Casper has more of a balanced foam feel that is more responsive. While both mattresses should offer nice pressure relief, the Puffy may perform just a bit better. If you are average-weight or lightweight, you will really sink into the mattress and feel little pressure on your shoulders and hips. The Casper is probably the better option for back sleepers because of its Zoned Support. This design makes the center third of the mattress firmer to give extra support under the hips. It should definitely keep you more supported than the Puffy. Read our full Casper review here. In terms of firmness, the mattress felt like a 6.5/10, or about average. I will note that I weigh 160 lb. Sleepers who are heavier than me may find the mattress to be firmer than I did. They may sink through the memory foam layer on top and feel the support layers beneath. The mattress felt nice when I was on my back. The foam conformed to my body and my hips were allowed to sink in the right amount. I felt best when I was sleeping on my side. I sunk into the thick layer of memory foam and felt little pressure on my shoulders and hips. On my stomach, I did need more support. My hips sunk in too far, and I felt out alignment. Again, heavier-weight sleepers may have a different experience. On their backs, they will most likely need more support. On their sides, they will probably press too far into the mattress. In terms of feel, the Puffy has that classic memory foam feel. While lying down, I slowly sank into the mattress. It felt like I was like sleeping “in” the mattress. The mattress has little bounce and the memory foam is not very responsive. You may have trouble moving around on the Puffy. Learn more about the Puffy’s firmness and feel in the video below. Memory foam mattresses are often the best at handling motion transfer. Considering the Puffy has 4″ of memory foam on top, I was not surprised by how well the mattress performed. During my tests, the glass barely moved when I disturbed the mattress. Also, when Marten moved around on the other side of the mattress, I felt almost none of his movements on my side. This mattress is a great option for couples. While memory foam is very good with motion transfer, it is not always the best with edge support. The Puffy is no exception. When I sit down near the edge of the mattress, it completely collapses. When I lie down near the edge, I feel like I may roll off or be ejected from the mattress. Overall, I would say the edge support isn’t a key feature of the Puffy mattress. You can see a photo of the edge support below. Joe said it was a 6.5/10. I thought it was closer to a 7.5 or 8/10. It definitely felt firmer than average. This is most likely because I am a larger person, and I press into the mattress more than Joe did. I engage the support layers, so it feels firmer. On my back, my hips do sink in a bit too far. However, I would say I feel supported overall. When I am on my side, I do press in too far, and I am feeling some firmness on my shoulders and hips. On my stomach, my hips are sinking in too far. I feel myself bowing into the mattress, taking my spine out of alignment. If you’re a larger sleeper like me, you’ll probably feel best while back sleeping on this mattress. However, the mattress may feel too firm when you are on your side and too soft when you are on your stomach. I think I may be too big for this mattress. If you are a larger person, you might want to look for a firmer mattress overall. Marten’s experience makes sense to me. As a heavier person, he pressed right through the soft layer of memory foam. He hit the support layer and felt real pressure on his shoulders and hips. Also, when he was on his stomach, his hips dropped right into the mattress. The Puffy is a bed-in-a-box mattress, which means it will come compressed and be shipped straight to you. You will want to begin by removing the rolled up Puffy mattress from its box. Then, preferably with another person’s assistance, position the roll on your bed. Carefully cut the away the first layers of plastic until the still-compact mattress can be laid down flat. Then, pierce through the final layer of plastic and the Puffy will expand. Simply clear away the excess plastic and allow your mattress to breathe and fully expand. It should offer great pressure relief for medium-weight and lightweight side sleepers. The thick memory foam allows you to sink in, so people of this size should feel almost no pressure. It gives you the classic memory foam feel without overheating. The memory foam is designed to breathe and promote airflow. 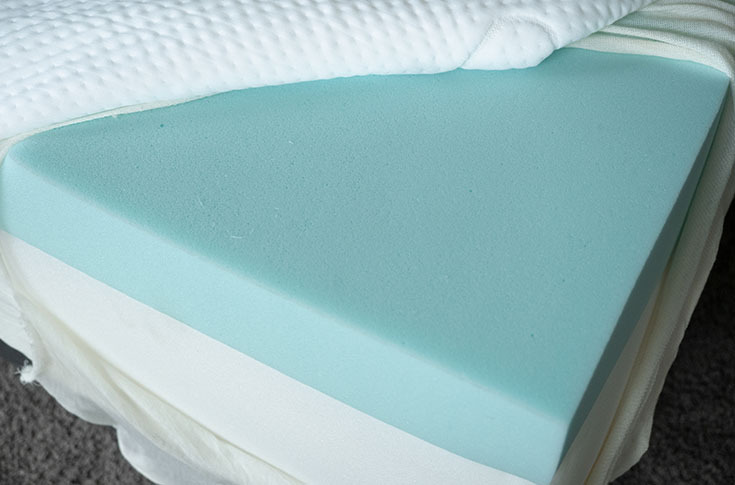 While many memory foam mattresses run hot, the Puffy should not. The Puffy should be a great option for couples. The memory foam in this mattress isolates motion very well. If you are worried about feeling your partner’s movements on your side of the bed, the Puffy should ease your mind. The Puffy is a quality option for those looking for a classic memory foam mattress. If you are medium-weight or lightweight and sleep on your back or stomach, the Puffy could be a great match. However, heavier people and most stomach sleepers are going to need more support than this mattress has to offer. The Puffy comes with free shipping, returns, a 101-night Sleep Trial, and a Lifetime Warranty. Please leave any questions about the Puffy in the comments below. I bought the Puffy Lux mattress and I feel that I get a deep sleep. However, I wake up with my neck and shoulders aching. I usually sleep on my side. I had a traditional mattress previously.